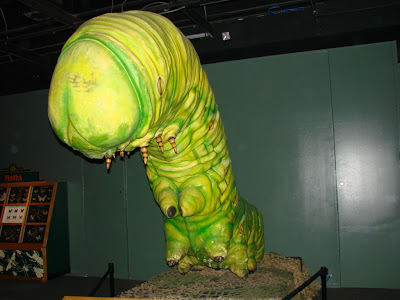 Ever wonder what it would be like to have a giant caterpillar towering over you… you can find out at the Bishop Museum exhibit Backyard Monsters: The World Of Insects going on through September 7. This picture is of the Tomato Caterpillar. It got its name since it like to feed on tomato plant leaves. It will one day cocoon and turn into a Five-Spotted Sphinx Moth also known as a Tomato Sphinx. 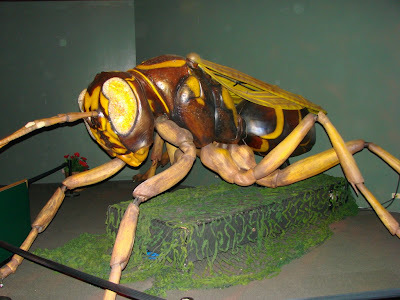 The exhibit has these giant animatronic displays as well as nine insect display cases and a full set of interactive exhibits where you can learn about insects. More details on the museum tomorrow. This is one of the two fighting Atlas Beetles at the Bishop Museum Backyard Monsters: The World of Insects exhibit. These beetles can grow up to 130mm in size though of course nowhere as big at the animatroic model. It is know for its size and for the horns seen on its head. 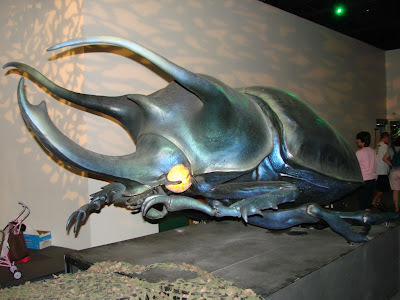 You can learn more about the Atlas Beetle and see a display of dozens of actual size beetles at this exhibit. Tomorrow the Tomato Caterpillar. This giant wasp is the Paper Wasp which is common in North America and of course Hawaii. These multi-colored social insects live in nests made of paper, hence their name. They use fibers from dead wood and plant stems and mix it with their saliva to build a brown paper nest. I had to use a flash in this picture due to the lighting in the room but somehow it makes the wasp look like one of those giant villains Kikaida would fight. Our series continues tomorrow with the Paper Wasp.